330ml cans of cider. I don't know how long it is on for, but thought it was a good deal. 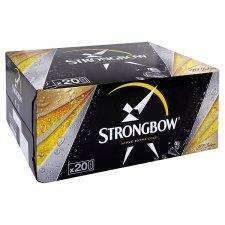 I have never seen a 330ml can of Strongbow. Is that why they a cheap or are they the 440ml size we normally get? If the later then a very good price. I have never seen a 330ml can of Strongbow. Is that why they a cheap or … I have never seen a 330ml can of Strongbow. Is that why they a cheap or are they the 440ml size we normally get? If the later then a very good price. Sorry..........they are 440ml cans. Just checked the box. Bought a 20 pack of the 440ml cans today from Tesco, they were £10. Thought that was a good deal in itself. if it's 440ml then that's a much better deal. Then I suggest you change the description. If anyone is interested they will read the full list of comments and see my apology..........but the main thing is, it's a good deal. Ive voted cold...These actually have a big £7.99 label on , but it is into fooling people they are £7.99 when actually it is £7.99 off the full price of £17.99 ...and they are £10.00 for 20 cans which is still a good deal...Me and my mate actually thought they were £7.99. Thank you mod's for editing my post. Ive voted cold...These actually have a big £7.99 label on , but it is … Ive voted cold...These actually have a big £7.99 label on , but it is into fooling people they are £7.99 when actually it is £7.99 off the full price of £17.99 ...and they are £10.00 for 20 cans which is still a good deal...Me and my mate actually thought they were £7.99.Typical Tesco trick..ps ..in the Whitehaven branchBabsy check your receipt!!! Receipt is in the shredder. When I pay on my debit card I always shred on the day. Receipt is in the shredder. When I pay on my debit card I always shred on … Receipt is in the shredder. When I pay on my debit card I always shred on the day. £10 for 20 x 440ml cans!!! £1.21 per litreNot that great. PPL wid low confidence drink alcohol most of da WORLD! Assuming it never was 7.99, does this thread need expiring? I'm assuming that English isn't your first language. Can someone take a picture of the "7.99" / "7.99 off" signage please? I … Can someone take a picture of the "7.99" / "7.99 off" signage please? I would like to see how misleading it isAssuming it never was 7.99, does this thread need expiring? yep, def £10 a case with £7.99 off full price. I saw this last week when I went shopping. The sign is a bit misleading, but always read the small print!! So the deal is 20 for £10, not £7.99. In which case the title needs amending. ``wid'' & ``da'' are not words. Neither is ``n'', ``i'' should be a capital, ``WORLD'' doesn't need to be in caps, ``PPL'' is also not capitalised, and not a proper word... I mean I could probably go on for another couple of lines but I'm sure you've got the message - that is if you can understand the complicated words I'm using. What it a word, anyway? You shouldn't have edited your post to add those links. "What it a word, … You shouldn't have edited your post to add those links. "What it a word, anyway?" doesn't make sense. Yeh yeh yeh!!! Muphry's law and all that! This is TEN QUID for 20x440ml - still a decent deal.